Back in May, I stopped by Manchester, UK, for two days, to see some friends before heading to Cambridge and London. Many scholars of history of science were in the city for the 24th International Congress of History, Science, Technology, and Medicine, including some of my friends, who were presenting papers at the Congress. After dinner, we decided to head to The Deaf Institute for some drinks. Blame it on jetlag, but it didn’t occur to me until we were actually standing in front of the bar, the historical significance of the building. 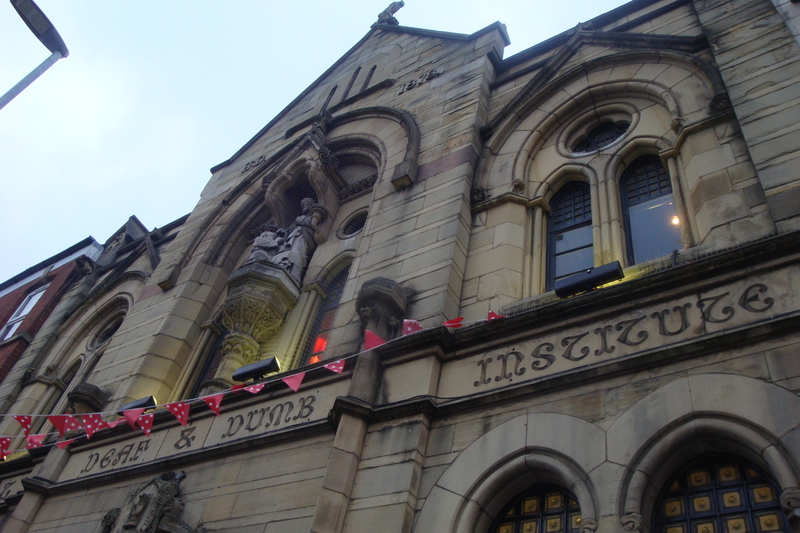 It was formerly the Manchester Adult Deaf and Dumb Institute, founded in 1877. Located on Grosvenor Street, and designed by John Lowe, the elegant gothic building was built at a cost of about £6000, opening its doors on June 8th, 1878. 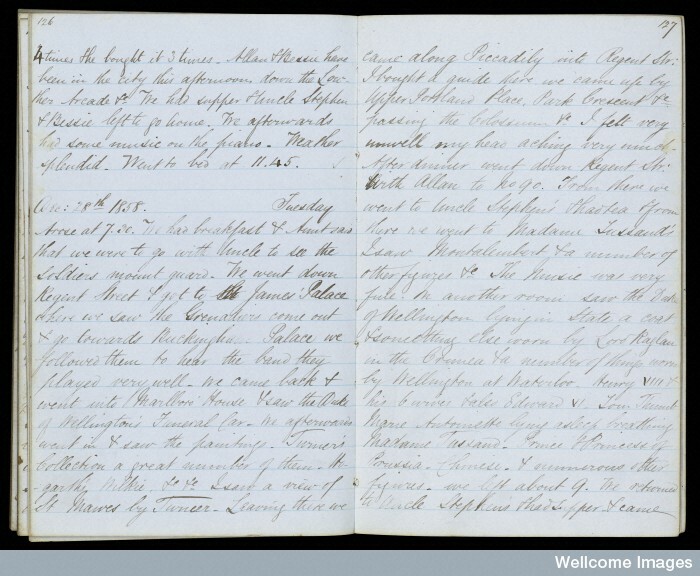 Just the previous month, I was doing some research at the Wellcome Library and came across a diary of James Patterson (b.1832), who was a teacher at the Manchester Institute for the Deaf and Dumb (est. 1824). James was the nephew of Andrew Patterson, who spent nearly 50 years teaching deaf students. Beginning his career as a schoolmaster in Devonshire, Andrew Patterson later worked as assistant master at the Manchester Institute, at the urging of his friend, H.B. Bingham, then the headmaster. Patterson left after five years of service to establish the Newcastle Deaf, Dumb, and Blind Schools. In 1832, Patterson returned to Manchester to take up the headmaster position upon Bingham’s retirement; he held the post until 1883. James’ diary is particularly revealing in regards to the day-to-day life of teachers. He writes of his daily excursions, his interests in painting, his experiences in London over Christmas break—and, most notably, how important it was for the children to learn the “School of Art.” Some days, James encouraged the children to draw for 2 hours daily in conjunction to their lessons in arithmetic and letters. He also made note of his own talents (and struggles) in drawing. Page from James Patterson’s diary, Christmas 1858 detailing his travels in London. I have been very much annoyed with Cordingley this morning, he was signing to the girls & I told him not to do so & he had the impudence to tell me that I did the same. After supper Mr Goodwin and I had a long chat about different subjects. He gave me an Account of how he became deaf and dumb it was brought on by fever one evening he thought his ears were burning and he begun to scream and all of a sudden his earring (sic) and speech were gone; he was only 4 years old then he said that before he came here to School he thought the Moon was God & he used to kneel down & worship it & when his parents saw him they were angry with him & would make him get up. when he saw the moon he always behaved himself well, but when he could not see it he used to make all sort of fun & make people laugh who saw him that was one of our chief things what we talked about.